What Is the Timing Chain? When Should You Have Timing Chain Replaced? What Is Done During Timing Chain Replacement? While traditionally the timing belt has been preferred to a timing chain, manufacturers have made the switch to using timing chains in the past few years. It’s a more reliable solution which lasts longer, and although it can be a little more expensive upfront, it will be the cheaper and more reliable option over time. Replacing the timing chain is a complicated job, and the labor costs can be quite high. For most cars, a timing chain replacement costs between $413 and $1040, or you can order the parts themselves for $88 and $245. It is a tricky repair though, so unless you’re particularly skilled it’s usually best left to a mechanic. Below are some sample costs for having the timing chain replaced at some of the leading garage chains in the country. Prices will vary from state to state and from car to car, but they should give you a rough idea of what you can expect to pay. 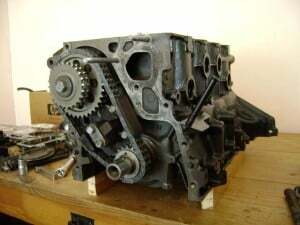 The timing chain works as the connection between the camshaft and the crankshaft, and the main responsibility of the chain is to operate the inlet and exhaust valve gear during the stroke cycle of the piston. The chain keeps these valves opening and closing at specific intervals, helping the engine to function properly. Until recently, the vast majority of cars were built to use a timing belt instead of a timing chain. 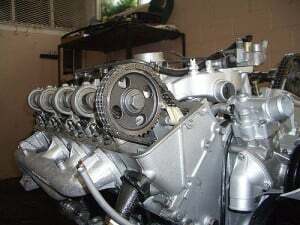 Using a timing belt was usually more cost effective than using a timing chain, with the only cars opting for the chain being higher-end sports cars. Recently this trend has actually been in the opposite direction, with the timing chain taking over as the preferred option. A timing chain will need replaced far less frequently than a timing belt, resulting in a lower cost to maintain the car for the owner. While a timing chain will usually last far longer than a timing belt, it will suffer from wear and tear and will need replaced at some point during the life cycle of the vehicle. Faulty timing belts can cause some serious damage to the engine if they’re not repaired, and in some cases it can completely disable the car. Manufacturers were being increasingly blamed for these problems, which has led many to make the switch from belt to chain. As a result, car owners need to more aware of what the timing chain is, how to spot a potential problem with it and how often it should be inspected and replaced. One of the main problems with the timing belt is that they weren’t being changed as often as they should be. Replacing a timing belt is a fairly costly repair, so many people would simply sell or trade in their car instead of having it repaired. In many cases this would result in someone else buying the car and not being aware of the timing belt problem until it was too late. The use of a timing chain helps reduce the likelihood of this happening as it’s designed to last much longer than the belt, so unless you’re buying a much older vehicle there should be less risk of major repairs in the future. There are usually a few signs that the timing chain on your car should be replaced, some more subtle than others. Poor fuel economy and occasional misfires could be caused by a timing chain issue, as could difficulty starting the car or the engine making a rattling sound regularly. If you notice any unusual sounds from the engine or anything out of the ordinary then you should take the car to your mechanic. They’ll be able to diagnose the issue and if it’s a problem with the timing chain it’s best to have the replacement done fairly quickly. While timing belt replacement can be expensive, the damage caused by a faulty chain will be much more expensive to fix so it’s best to tackle the problem early. By taking the financial hit early you can avoid major engine damage which can cost thousands of dollars to repair. Replacing the timing chain is something which should be carried out by a qualified professional rather than a repair you attempt at home. It’s a complex and time-intensive repair, and getting it wrong could cause some pretty serious and expensive damage to your vehicle. The best way of saving money on timing chain replacement is to have the work done early before it causes any further damage to your engine. The cost of the replacement can be high, but it’s a mere fraction of what you’d have to pay if it started causing problems with other parts of the engine. Get a few quotes from garages in your area to see what you can expect to pay, and go with the place that offers a fair price and which has a good reputation. Quality work is every bit as important as saving money on your auto repair, so go with someone good who won’t rip you off. Below are some example costs for replacing the timing chain on some of the most popular models in the country. These prices should be used as a guide only, as every garage will have their own pricing structure.